Let me just take a moment to recommend a recipe to you all. This has got to be the easiest, cheapest little number ever. This time of year, we can all use a bit of that cheap and easy in our lives! But it is also super good and kid friendly too. Try it with a salad and crusty bread for the easiest ever entertaining menu! Preheat oven to 275 degrees. 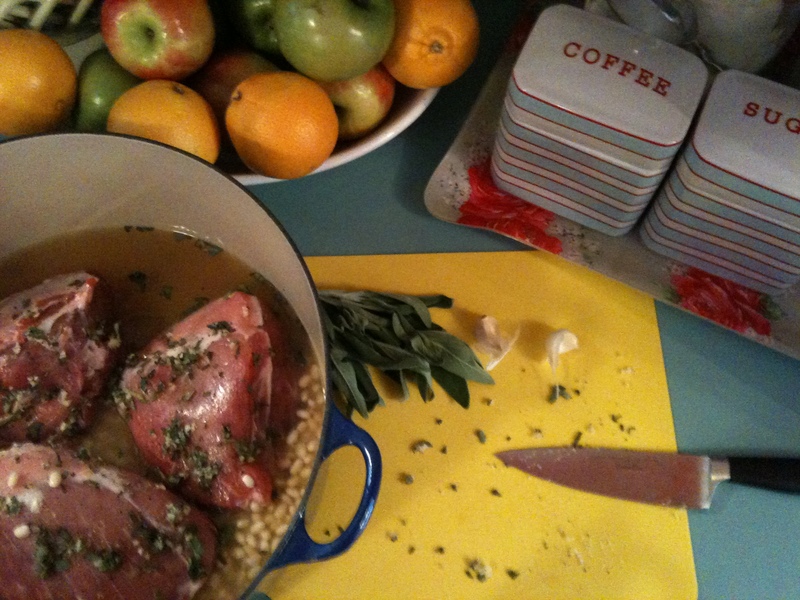 Mince a teaspoon of fresh sage and three garlic cloves. Grind in (with the side of your knife) a teaspoon of kosher salt and the pepper. Rub all over the pork. Place beans, 4 c. chicken broth, remaining five cloves garlic, remaining sage, teaspoon salt, and bay leaves in a dutch oven. Lay the pork on it, and bring to a boil. Cover and pop in the oven for 4 hours, or until pork is very tender. Discard bay leaves. Pull pork into chunks, and serve with the beans on the side. Would be beautiful in a shallow bowl with the pork on top and some fresh sage to garnish. This looked so good I went out and bought the ingredients for it yesterday — I hope to make it next week! Thanks for sharing! Is this possible to make without a dutch oven? Evie — I’ve learned the hard way that beans don’t cook in a crockpot, so you’d need to cook those completely on the stove first. We made this over the weekend and it was a huge HIT! Thanks so much for sharing Rachel! Wish we still had a crockpot; sounds like it would work to me (with adjustments). If you soak the beans overnight, they should work in a crock-pot.